More than 3 million years ago, the Arctic became a fish highway as species from the north Pacific Ocean spread through the Bering Strait and into the Arctic Ocean and then into the north Atlantic Ocean. Now it's beginning to happen again. A new study published in the journal Nature Climate Change suggests that as climate change warms the Arctic over the next century, the natural ice barrier that has kept these two marine biotas separate will disappear, allowing fish from the Atlantic and Pacific to mix. This will create unknown consequences for fishing communities from Norway to Alaska, as well as the ecology of both regions. Using predictive modeling, a group of international scientists across multiple fields showed that once ice melts and the interchange begins, changing oceanographic conditions like sea temperatures, salinity and currents will contribute to changes in the distribution of many commercial fish. Biodiversity is likely to explode in places like the Svalbard coast, the Barents Sea, the coasts of Iceland and the Alaskan coast. "Our results show that the North Atlantic and North Pacific, which contribute to nearly 40 percent to global commercial fish landings, are likely to be ecologically affected by new arrivals of species with climate change," Mary Wisz, co-leader of the study and a senior ecosystem scientist at DHI, a private consultancy and research institute based in Denmark, said in an email. "Our models forecast there will be an explosion of fish biodiversity in these areas during this century." Researchers have long suggested a mixing like this would occur in the Arctic, but new availability of data on where fish species are found, as well as models that forecast future conditions, enabled the multidisciplinary team to predict the forthcoming geographical distributions for 515 of the most common species found in the northern latitudes. "We can see the extent of sea ice shrinking, and it looks like projections we have of an open Arctic passage are going to come true and sooner than we thought," said Jason Link, a senior scientist for ecosystem management with the National Oceanic and Atmospheric Administration who was not involved in the study. "What we can say is there will be change. What is more difficult is the direction of that change." In November of 1869, the Suez Canal, a man-made waterway through Egypt, connected the Mediterranean and Red seas. It provided scientists with a modern example of what happens when two formerly separate marine biotas mix. The Red Sea is generally saltier and contains less nutrients than the Atlantic, so the Red Sea species have advantages over Atlantic species in the eastern Mediterranean Sea. About 300 invasive species have been cataloged in the Mediterranean and pose significant ecological challenges for native species. 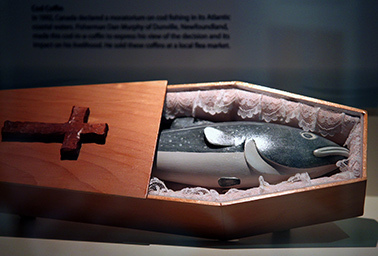 In 1992, after Canada declared a moratorium on coastal cod fishing, a fisherman made this cod in a coffin to express his dismal view of the future. But the cod, a noted predator, may come back as warming waters concentrate its prey in the Arctic. Photo courtesy of Flickr. "In the Mediterranean, when we opened the Suez Canal, we turned over the food web from species coming in," Link said. In the Arctic, however, Link said he expects the impacts from this interspecies mixing will probably impact diversity more positively and increase productivity. Nearly 40 percent of the world's commercial fishing landings are in the Arctic, and that will create a huge economic opportunity for fisheries. Already climate change has pushed mackerel northward toward eastern Greenland, contributing to a 53,000-ton catch in 2013, Wisz said. As resources in the Arctic are being unfrozen by climate change, from oil to gas and a potential growth in fishing capacity, one concern is how to manage the area with the interests that will want to exploit them. The expansive geography and international nature of the Arctic will make managing the area an interesting challenge, Link added. "That's a lot of fish," Wisz said in an email. "The challenges of course will be that we don't know how things will play out in these new ecological contexts." For example, the researchers' models indicated that few top predators are expected to be involved in the coming mixing, with the exception of Atlantic cod and lingcod, two aggressive predators that have the potential to dominate their new ecosystems. "If cod moves to Pacific Northwest, there are already species like that there," Link said. "How they will interact is unknown, but it looks like there could be competition with those who eat the same types of food." On a positive note, Geerat Vermeij, a distinguished professor of Earth and planetary sciences at the University of California, Davis, who has written on this subject before, said although the coming invasion will certainly have effects, he doesn't think species extinctions will be one of them. Vermeij expects to see the diversity of Atlantic fauna grow in parallel to what happened millions of years ago, as he put it, "in the recent geological past." For example, every common fish found today on the New England coast originated in the Pacific, he said. Wisz said her team would next like to use emerging dynamic modeling tools to look at how fish species are expected to disperse based on current patterns and spawning requirements as well as examine how food webs might change. This type of data could help fisheries prepare for the coming changes and inform shipping routes to bypass areas that might become fish-rich. Link said it's important to note that in addition to warming, there are other changes driven by climate change that will affect the Arctic such as ocean acidification and shifts in global circulation, which were not factored into the new research. As far as what humans can do to prevent or prepare for the coming invasion, Vermeij said it's a matter of when, not if. "It's just a prediction, so they can go wrong," Vermeij said, "but this is one place where knowledge of the geological record really can inform us of the potential in the future. Humans certainly can't prevent it or really prepare for it, but it would be nice to document it."